The Best American series is the premier annual showcase for the country’s finest short fiction and nonfiction. Each volume’s series editor selects notable works from hundreds of magazines, journals, and websites. A special guest editor—a leading writer in the field—then chooses the best twenty or so pieces to publish. This unique system has made the Best American series the most respected—and most popular—of its kind. From quiet, elegiac, contemporary tales to far-future, deep-space sagas, the stories chosen by guest editor Karen Joy Fowler and series editor John Joseph Adams for The Best American Science Fiction and Fantasy 2016 demonstrate the vast spectrum of what science fiction and fantasy aims to accomplish, displaying the full gamut of the human experience, interrogating our hopes and our fears—of not just what we can accomplish or destroy as a person, but what we can accomplish or destroy as a people—and throwing us into strange new worlds that can only be explored when we shed the shackles of reality. The Best American Science Fiction and Fantasy 2015 includes: Salman Rushie, Sofia Samatar, Charlie Jane Anders, Ted Chiang, Kelly Link, Maria Dahvana Headley, Adam Johnson, Kij Johnson, Catherynne M. Valente, Dexter Palmer, and others. The 2016 volume collects the best material published in 2015, selected by series editor John Joseph Adams and guest editor Karen Joy Fowler. Intellectually demanding […] a very elite, highly curated set of stories. […] A set of primal, classic-seeming tales from our past, present, and future. 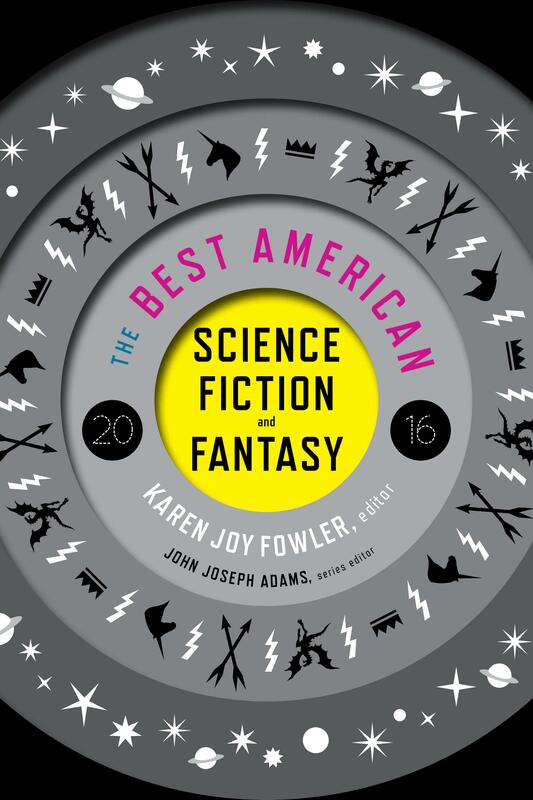 The second edition to the Best American Science Fiction and Fantasy, edited by Karen Joy Fowler, is just as strong as the first, if not stronger. […] Showcases the nuanced, playful, ever-expanding definitions of the genre and celebrates its current renaissance. There has never been a better time in science fiction and fantasy short fiction, and you need look no further than this collection to see that truth. Within, you will find magic, aliens, dystopia, fairy tales, terrifying technology, far-flung futures, uncanny planets, and more. But you’ll also find heartbreak, laughter, compassion, complex morality, acceptance, strength in numbers, love, justice, the absurd, and the bittersweet. Let this collection take you to lands uncharted, and lands unknown, and lands unseen—you will be glad you went, and in these countries, there is something for everyone. Deliver[s] a thoughtful array from a star-studded assemblage of writers. […] It will leave readers with plenty to think about. Whether conjuring a little magic or exploring technology’s impact, these impressive selections demonstrate that these works may be brief in length but long on complexity and voice. Sophisticated sf/fantasy readers will find here everything they enjoy about the genre, plus a few other surprising delights. An impressive and intriguing array of twenty authors [who] are some of the most talented, versatile and imaginative practitioners of sf/f/h today. These stories question the human experience; they ask us to check our assumptions; many of them delight us and trick us with powerful, beautiful, I might even say magical language. At the very least they provide a survey of what’s possible under the big tent of SFF. I recommend Best American Science Fiction and Fantasy 2016 to anyone who is interested in the state of the SFF field.